Our farm grows 12 varieties of Gerberas. These flowers do not want too much water. They also don’t like to be planted too deeply into the soil, are quite susceptible to mildew. We try not to water them from overhead and only water them early in the day. A little tip: These flowers can last quite long because of its sturdy stems and tough petals. They can last weeks with proper care. However, always remember that you should not introduce them right away to direct sunlight. Do it slowly, otherwise they will wilt. 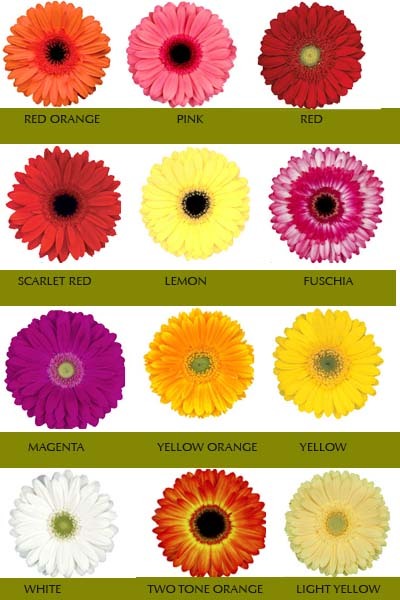 Did you know that the Gerbera, is not a single flower? Each supposedly single flower is composed of hundreds of individual flowers! I adore these vibrant flowers and use them all the time for our dinner table. I feel like Gerberas have the look of a razing fire and the sun altogether. Its colors can be as yellow as a spark, as orange as a flame, and as red as a blaze! The gerberas’ petals shoot out like rays of the sun too.